It was a somewhat mixed week for US equity indexes, with net weekly changes ranging from +1.41% (Dow), +1.24% (Trans), +0.59% (sp'500), +0.50% (nyse comp'), +0.36% (r2k), to -0.29% (nasdaq comp'). Near term outlook offers new historic highs before end month. 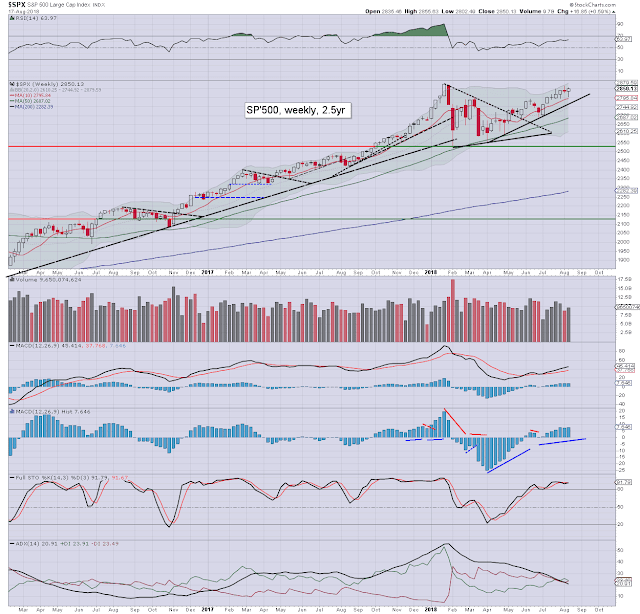 The sp'500 swung from a low of 2802 to 2855, settling +0.59% at 2850. Underlying macd (blue bar histogram) cycle is on the moderately high side. In theory, there is a comfortable 1-3 weeks of further upside, which does offer new historic highs within the near term. 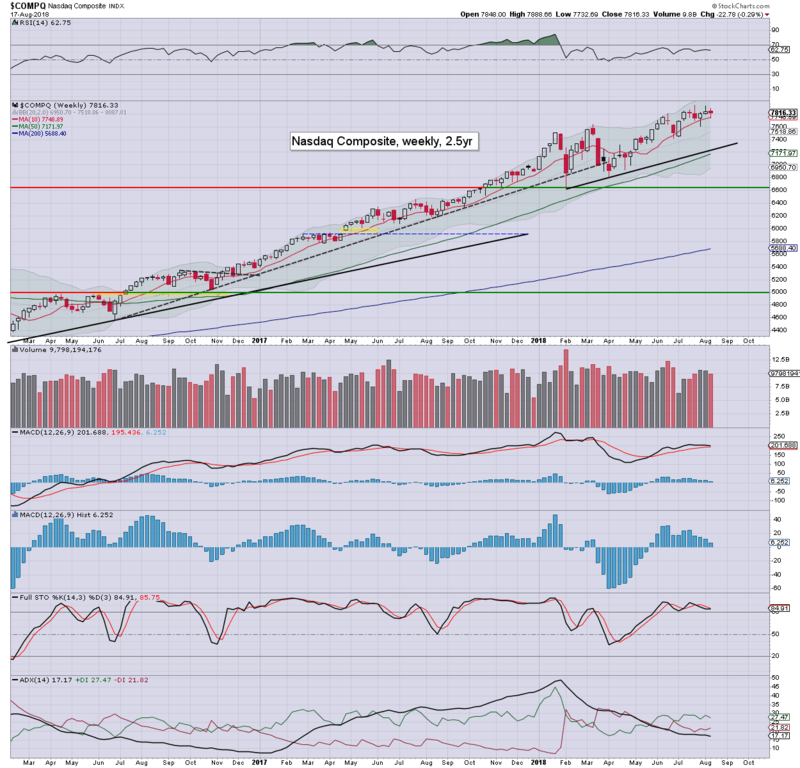 The Nasdaq was the laggard this week, settling -0.29% to 7816. Underlying macd continues to tick lower, with price momentum close to turning outright negative. New historic highs (>7933) are within range before end month. The mighty Dow lead the way upward this week, settling +1.41% to 25669. New historic highs look out of range until at least after the Labor day holiday (Sept' 3rd). The master index gained 0.5% to 12908. Note the spike floor from 12648, which is indicative of a s/t floor. New historic highs look out of range until at least late September. 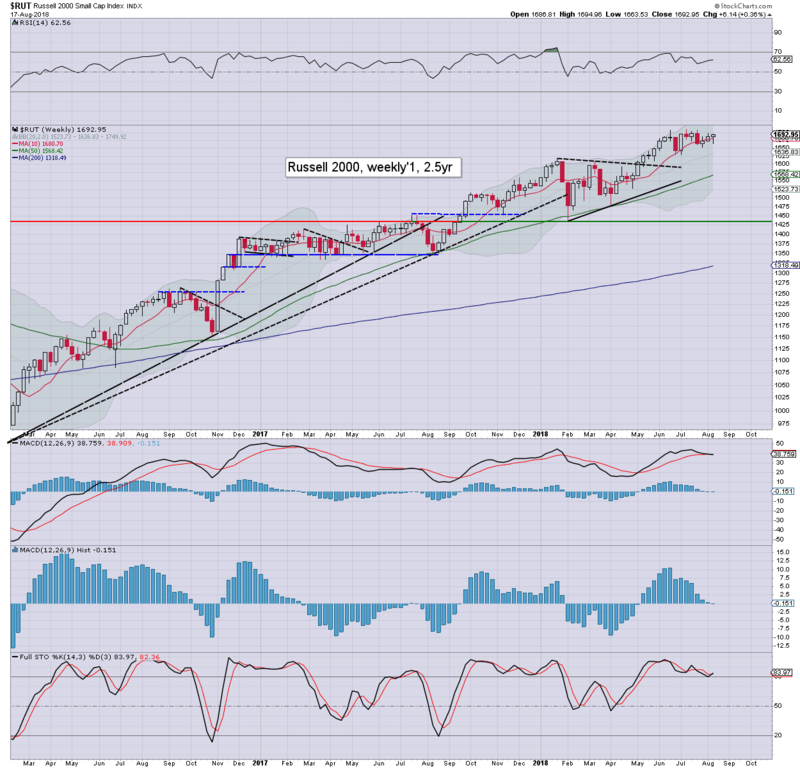 The second market leader climbed for a third consecutive week, +0.36% at 1692. 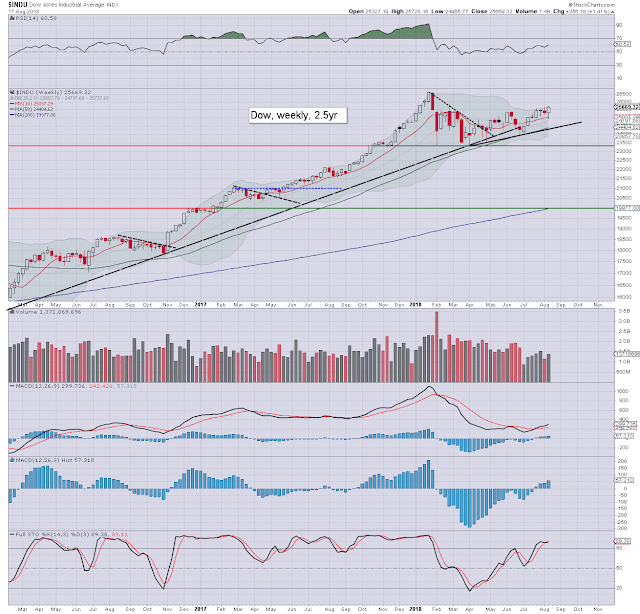 Note the macd, where s/t price momentum is stalling/leveling out, rather than turning outright negative. Upper bollinger is offering new historic highs in the 1740/50s in the immediate term. 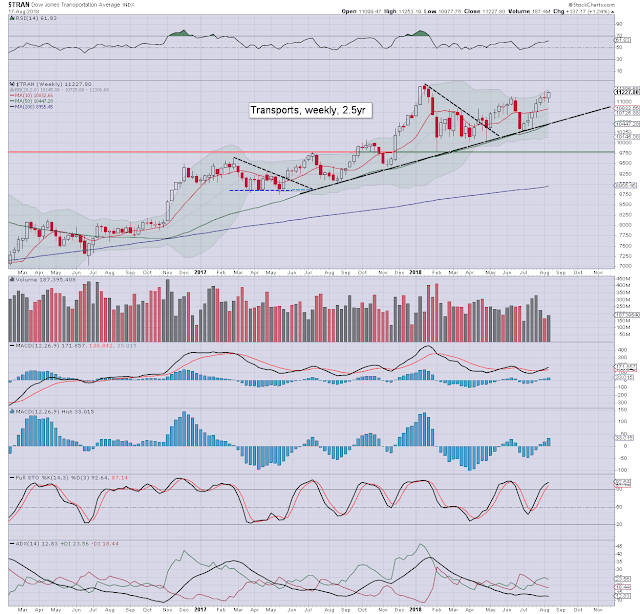 The 'old leader' settled higher for the sixth week of seven, +1.24% to 11227. 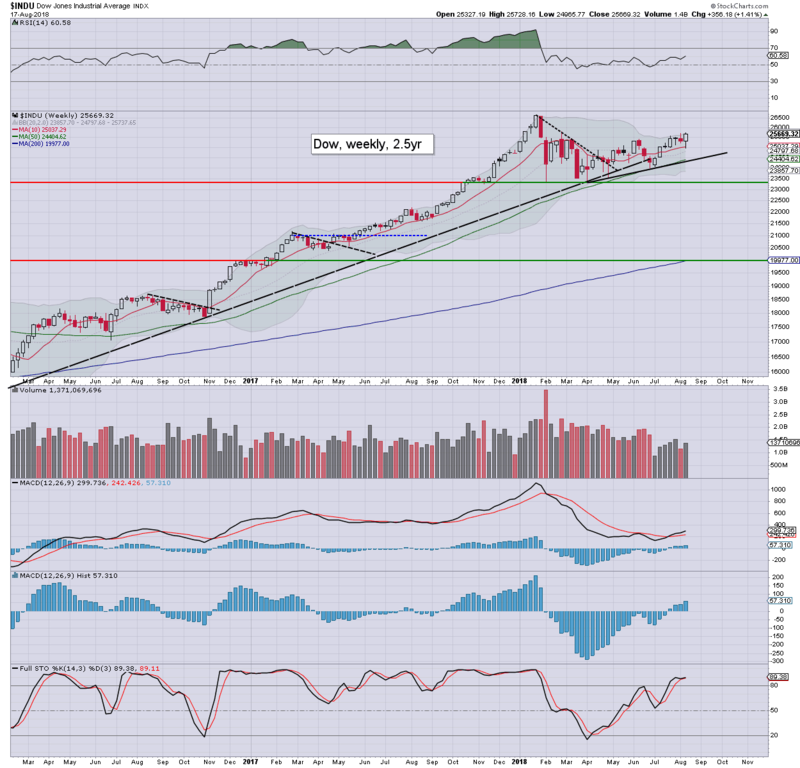 Price momentum is on the moderately high side, with new historic highs viable within the immediate term. 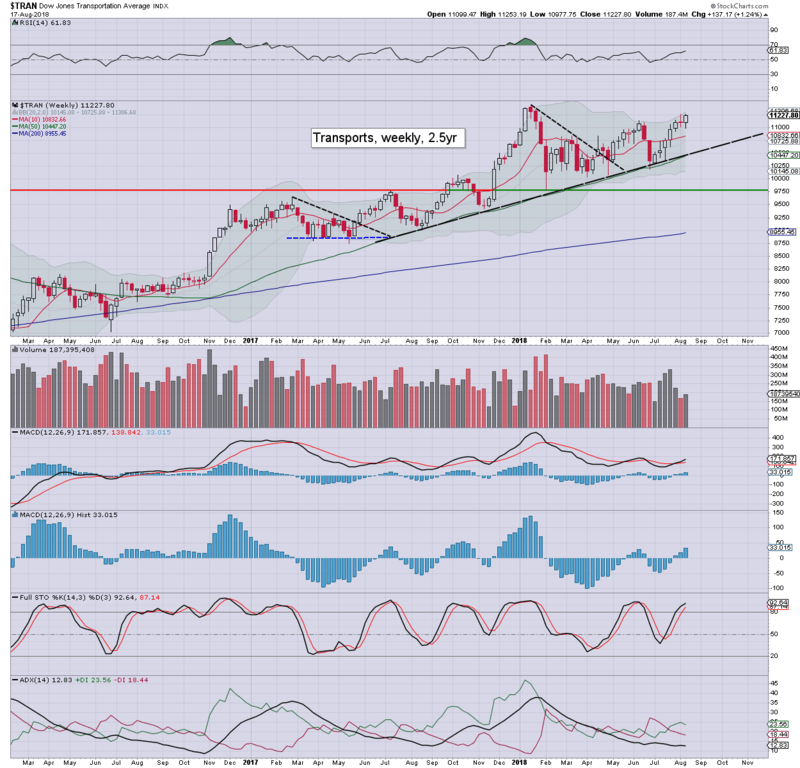 Ongoing cooling in WTIC is certainly helping to lift the sector/index. Five indexes settled net higher, with one net lower. 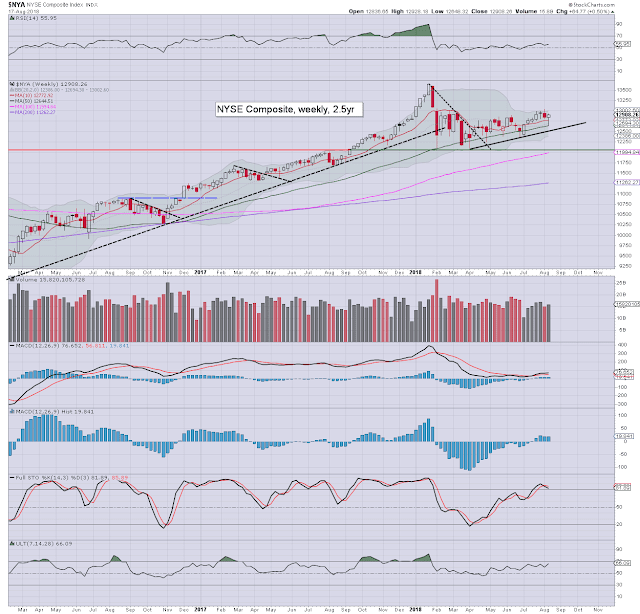 The Dow and Trans are leading the way upward, with the R2K and Nasdaq comp' trailing. 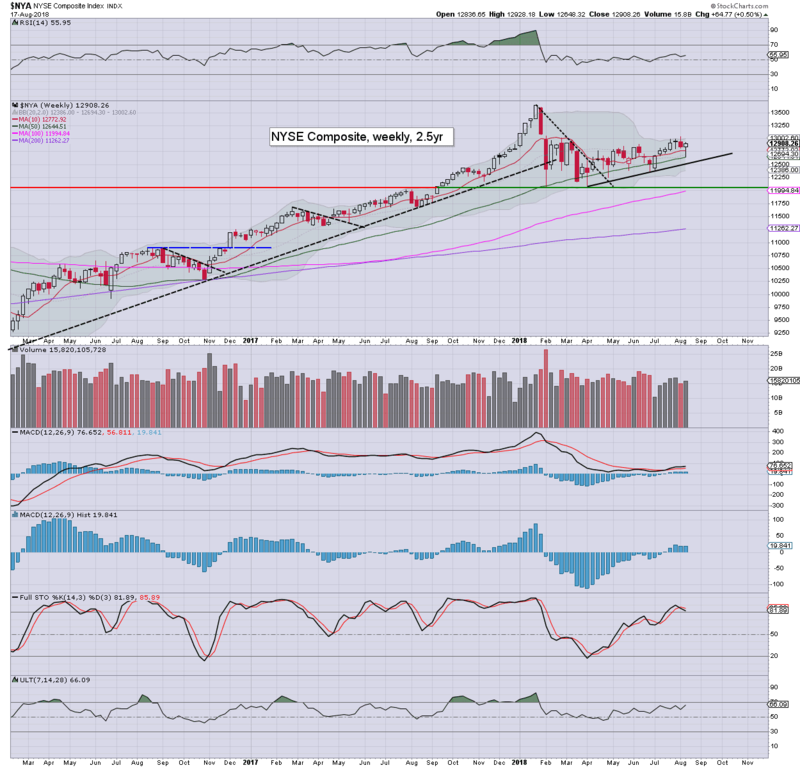 New historic highs in the sp', r2k, nasdaq comp', and transports, look viable, if not probable before end month. The issue is whether such new highs are quickly reversed. If they are, it would be a subtle warning of problems for Sept'>Nov'. The Nasdaq comp' remains the leader this year, currently +13.2%, with the sp' +6.6%. The nyse comp' is the laggard, currently +0.8%. *Fed Chair Powell will be speaking Friday morning, at Jackson Hole, and that will garner a great deal of mainstream attention. A Sept'26th rate hike is on track, with the QT program set to hit $50bn pcm. If you value my work here, and on Twitter, subscribe to me.